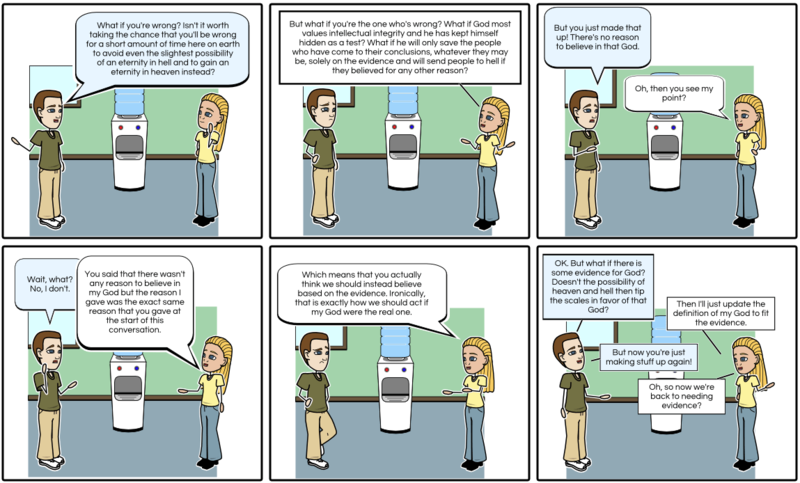 This entry was posted in Apologetics and tagged Pascal's Wager. Bookmark the permalink. Travis, you are among the few who actually understood Pascal’s wager. Pascal was a fideist and like Hume, Kant, Barth and Kierkegaard rejected faith based on rationale. For them it is foolishness to proof the existence of God base on reason alone. His wager thus ought to be understood in the existentialism of their time. Is belief in God worthy than the verse? Pascal’s wager appears to be less concern with the true of belief in God but the benefit of such belief. If this is true the challenge above does not render it impotent. It could be true that God desire us to use our rationale but that is not what the wager is about. The wager is about the benefit not the truth. Thus it is compatible with the idea that God want us to use our rationale. You raise some interesting thoughts in your comment but I’m afraid one of us is not understanding the other. While it is true that the wager comes on the heals of Pascal’s assertion that God is unknowable, the discussion that I have presented here aims to show that evidential agnosticism is not sufficient for acceptance of the wager. Without an evidentially grounded definition of the causal relationship between God belief and the afterlife, there is no eternal benefit to accepting God belief as “fire insurance” – both belief and unbelief, in the absence of evidence, are equally insured. Having said that, there may be a pragmatic advantage in the here and now, but I do not understand Pascal’s Wager to have been addressing that possibility. That pragmatic consideration, however, was precisely the inspiration for this post and that will be made more clear in the next post. Travis, I believe I need to expound more. Pascal wager is not about the truth of the belief (or unbelief), and thus it care less whether there is presence or absence of evidence. Evidential agnosticism only comes to play when we are dealing with truth of the belief (or unbelief) but not when we deal with the benefit (something can be beneficial even if it is false). With truth, we need to first know whether or not it is true that God exists and there is afterlife to which the some are given eternal bliss while other eternal judgment. Evidence or reason are called for when it comes to truth. P: Travis, I am a fideist. I believe that reason cannot decide this question. It is irrelevant for my argument. The wager is not about whether it is true , to which you would be correct in asking for evidential ground and evidences if that was the case, but if and only if it is true, how will you wager Travis? Hi travis I am just getting back into blogging after a break. I am glad to see you are still blogging so I have some good reading ahead. I think my response to the second cartoon picture would be – I don”t think it is intellectually dishonest to act rationally. If God is going to punish me for acting rationally then ok, whatever. I mean what can we do if there is some God that judges us irrationally? On the other hand if God is reasonable but I am irrational in my rejection, well that is something I want to avoid. Then generally, of course, there is the issue of evidence. We can call the evidence of the new testament is what it is. But it is some evidence for the Christian God. There is nothing close to that sort of evidence for the god that punishes people for believing the truth of his existence. That said I think Pascals wager in its pure form as he put it has some issues. However the basic method of how we should weigh the consequences of any action, including what we choose to believe, is sound. I don’t think it is intellectually dishonest to act rationally … what can we do if there is some God that judges us irrationally? I take it that acting rationally in this case means “all else being equal, we should seek to believe in such a way that our beliefs will lead to the preferred outcome”. Given this, why is it more rational to believe that God condemns those who reject his existence for lack of evidence, instead of believing that God condemns those who accept his existence despite a lack of evidence? We can call the evidence of the new testament is what it is. But it is some evidence for the Christian God. There is nothing close to that sort of evidence for the god that punishes people for believing the truth of his existence. This is why that last panel is key. You can take all the evidence for the traditional Christian God and use it to define the God proposed in the second panel. That is, make it so that the only difference between the two is the criteria by which God assigns judgement. What is the evidence for one over the other? Note that this is only the same as the question I asked above if your answer to that one is to appeal to some sort of evidence, which I agree makes it rational, as I noted in the closing paragraph of the post. Ok I think I now understand where you are going with this. I agree that we do need some evidence. (Although one could argue that a God that based his entire judgment on believing a falsehood would be irrational, I won’t argue that.) Let me focus on that last frame. Lets say someone comes and says that the one true God sent him. And to give evidence of this he says by this God’s power he will raise a dead person. Now he tells us that this God requires that we believe in him. And then he raises the person from the dead. Ok do we have evidence of God? Yes I think so. I think miracles in this context are evidence of God. Do we have Evidence that this God wants us to believe in him? Well its possible that the person was lying about this. He may have mislead us right? I mean maybe he can wield this God’s power but he is decieving us on whether we should believe, or maybe he was mistaken. But on the whole we still have better evidence for the God that wants us to believe than the God that does not want us to believe. I actually have an analogy that I was going to blog but never got a chance. I was going to post it as analogy suggesting that Christian ethics are more reliable than ethics made from other people but I think it fits here as well. It’s a bit rough but bear with me. Lets say you are held hostage with a few othrs and were taken on a commuter plane and held in the cargo area. You were all blindfolded even before getting on the plane and the entire time you were on the plane. So were the other hostages. But it was a commuter plane and those who paid for the ticket were not blindfolded before or during the flight as far as you know. Now the plane crash lands in the ocean but you and 3 other passengers survive. Unfortunately you are in the middle of the ocean and you have no idea where the closest shore is. Now let’s say there are 2 other hostages who were blindfolded with you and taken on the plane as well as one other person who you had never seen before. Now this other person is dying fast and he knows it. But right before he dies he clearly communicated that he was looking out of the window and the plane had been over water for a long time but he had clearly just seen land not far in a certain direction. Now you know he was a passenger because you see he had a ticket – none of your blindfolded hostage mates had tickets. But the hostages are very outspoken about their own different views on which direction you all should swim. But you know they were just as blind as you. But this other person had a ticket which suggests he may have better information. But could he be lying? Sure. After all he knew he was about to die and it may not have mattered to him. Could he be mistaken? sure. But for the most part I think we would agree that the evidence for the direction he gave is better than the beliefs of the other hostages. That direction seems the most rational direction to point. Jesus who provides evidence he is from God tells us God wants us to believe. I think the evidence for that God is better than the evidence for the other hypothetical God who does not want us to believe in him. The New Testament documents are better evidence for the God Jesus describes. I think this is all it comes down to and so I hope I can clarify why the rest of the discussion is just an elaboration on this. Jesus who provides evidence he is from God tells us God wants us to believe. I think the evidence for that God is better than the evidence for the other hypothetical God who does not want us to believe in him. Here’s the problem. The alternative presented in the second frame isn’t that there is a God who does not want us to believe in him. It is that there is a God who judges us based on whether we are true to our perception of the evidence, no matter where that leads. If the evidence leads you to believe in the God of the Bible, then this alternative God will judge you as having done well. If the evidence leads you to Buddhism, Islam or atheism, then you get the same result, no matter what your belief is. It only matters that you acted in accordance with the evidence you perceived. This would even include the pragmatic believer, who sees evidence that their life would be best lived within a framework that carries a lot of evidential baggage. For them it is a matter of the pragmatic evidence outweighing the logical evidence. With respect to the wager, I agree that it is rational to accept the bet if the evidence favors the God who judges us solely on belief in his existence. But that is not what I see. To me, the evidence suggests that the idea of a God who judges solely on belief – the evidence being divine revelation of the Bible and religious tradition – is best explained as a product of humans. This, combined with divine hiddenness and several other factors, leads me to see that the evidence best fits with either a deistic God or an absence of God. Now look at what happens if I take this result and constrain it to the context of the two options in the comic, that there is either: (a) a God who judges based on our belief in his existence, or (b) a God who judges based on our following the evidence. I just said that, to me, the evidence points against the God who judges based on our belief in his existence and toward a deistic or non-existent God. So, while the evidence does not necessarily suggest to me that the God who judges based on our following the evidence actually exists, the evidence does better correspond with that definition of God. So, in a sense, I am accepting the wager but I am doing so for a different God. Having said that, I hope it becomes clear that the wager is actually irrelevant. We should just look to see where the evidence leads and follow it to its conclusion. As is pointed out in the 5th frame of the comic, this behavior is ironically exactly how we should act if the real God is the God who judges based on our adherence to the evidence. Hi Travis I haven’t been completely ignoring this post. But do get the sense I am getting a bit better understanding of what you are saying each time I read your last response. I think. Therefore I don’t believe in any God. But you are not saying we this God does not want us to believe in him – only if the evidence suggests we should not believe in him. I am not sure that really helps. 1) I believe in a God that doesn’t want me to believe in him if the evidence doesn’t support that belief. 3)Therefore I don’t believe in that God. took a slightly different path than yours. I thought he said there are an infinite number of God’s that might give us infinite consequences. Therefore even if we think one is more probable since there are an infinite number of options they are all still mathematically equal. It went something like that I think. Perhaps it wasn’t lycan perhaps it was a response to Lycan. I read these arguments a long time ago. As far as I can tell, however, they never went on to consider the response I gave you, which is to narrow ourselves to the traditional god of Christianity and the god who best fits all of our evidence and judges us based on our sticking with the evidence. When such constrained, if I think the evidence favors a deistic or absent god, then it is that second god which is objectively more probable (though I don’t think “objective” is an appropriate qualifier since we will all interpret the evidence differently). As Lycan acknowledges, the rational thing to then do is to anticipate the more probable god’s judgement. In the case of my example, this implies that we should simply follow the evidence wherever it leads, even if that leads to a belief in the absence of gods. Interesting post. First time I actually came across Pascal’s wager, however it reminded me of a similar discussion I had with my mother and younger sister when I was 21. The religion we adhere to is Islam. So what they were saying was “it’s better to believe in God even if we may have doubts as to the ultimate truth” “…because if your doubts are wrong then you go to hell, if you are right then nothing happens” “… the thing to gain by sticking to the doubts isn’t much so it’s better to be safe and believe in God and our religion”. etc. etc. you get the idea. The possibilities seem infinite. So which option do I chose to gain the most and lose the least? Secondly is it even within my capabilities to make that decision? Thirdly is it even relevant? Since I don’t know for sure I should go with what I can do best, want to do etc. and forget worrying about this. Perhaps God exists and he is rational as well but we may be irrational in our understanding of God’s rationality. It seems that we’re in agreement. Without any evidence for one particular “afterlife acceptance criteria”, the best we can do is follow the evidence wherever we think it leads. Otherwise we’re arbitrarily favoring one particular claim over all others without any justification for doing so.